I keep telling myself I’m not really interested in single seater racing as I profess to be more keen on historic sports cars, road cars or cars that at least bear a passing resemblance to road cars. Going to a meeting at which no less that 5 of the 9 races were for single seaters seems with hindsight to be just a little bit bonkers. 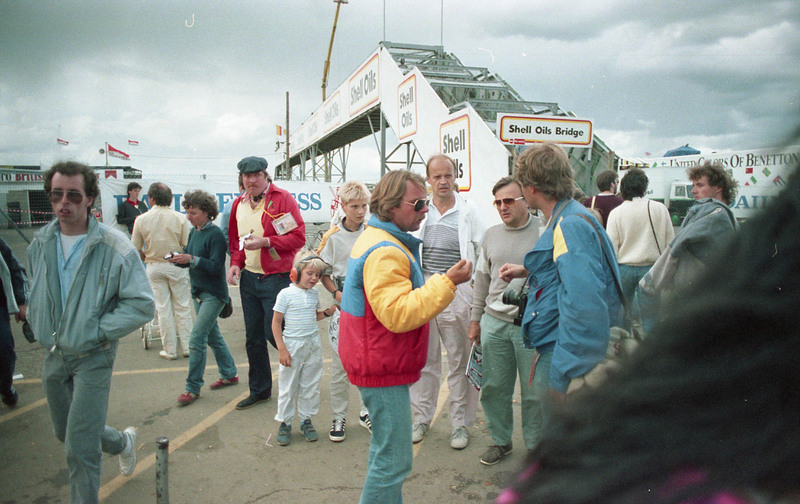 What dawned on me during this meeting however was that I’d watched and thoroughly enjoyed an enormous number of single seater races at Silverstone from when I first started going there in the early ’80s. In fact at that time I was probably watching some of the cars participating in this HSCC event. How time dims the memory and magnifies bias! One single seater race I can vividly remember was when Rosberg senior (Keke) secured the fastest ever lap at Silverstone at a speed of 160.924 mph during qualification for the 1985 British Grand Prix in his Williams Honda FW10. This lap has never been beaten and Rosberg achieved it despite having a slow puncture! Was this down to bravery, madness or him just being Finnish? Discuss! Single Seaters – OK I do like them! HSCC Derek Bell Trophy Race. Another Silverstone single seater race I remember from old was a Formula Ford race when rain showers suddenly turned into a deluge of biblical proportions causing an entire phalanx of Formula Fords to instantaneously aquaplane off the track in all directions at Woodcote corner – like an experiment in explosive Brownian Motion. History repeated itself to a degree in the 1st race of the day when a gaggle of Formula Fords came together in damaging circumstances at Luffield making heavy work for the marshals and recovery trucks. Subsequent races provided frenetic fun for the spectators and it was incredibly interesting to see such a plethora of single-seater race cars being fettled inside and outside the pit garages during the course of the day. My admiration goes out the the owners, drivers and “carers” for their dedication in actively racing these wonderful machines. The Gurney Eagle FA74 looked fantastic and it was on superb eardrum-rupturing form when its engine was fired up in the pit garage. On track it finished in 3rd place behind the March 79B (1st) and the Chevron B37 (2nd) in the Derek Bell Trophy Race. There were a wide range of well known historic marques represented in the Formula Ford, Formula Junior, Formula 2, Formula 3, Formula Atlantic, Formula 5000, Formula Super Vee and Classic Racing Car categories including Brabham, BMC, Cooper, Elva, Gemini, Ginetta, Lola, Lotus, Mallock, Merlyn and Ralt. The ex-Ayrton Senna Ralt RT3/83 was interesting from a historical perspective and it was also great to see the very pretty De Tomaso ISIS and cars from Bandini, Stanguellini, Bond and Dastle. These cars raced in the Guards Trophy race alongside some pretty potent road going sports cars in the form of TVR Griffiths, Lotus Elans, Porsche 911s, Marcos 1800 GTs and others. The beautiful light blue P69 (Number 41 below) just flew round the track to achieve (what the driver made look like) an easy win. Along with another P69 (number 33) and a Lenham Spider (number 2) these cars represent an important period in the history of Lenham which is better known for it’s modified Spridgets and light-weight Spridget body panels. These race cars came about when Roger Hurst linked up Julian Booty and Peter Rix of Lenham Motor Company to combine their respective skills in racing and lightweight car construction with the very ambitious long term aim of creating an innovative road going sports car. Whilst the road car never really took off the race cars with their aluminium reinforced space-frame chassis, light-weight fibreglass tub, nose and tail sections and pokey 1.6 Litre Lotus twin-cam engine proved to be highly competitive in club racing. A number of other cars from Brabham, Chevron, Ginetta and Lotus also stood out in terms of their immaculate presentation and race preparation combined with some very brave driving in the Guards Trophy race. The Brabham BT5 really stood out in its bright yellow colour scheme with green stripe. This car was Brabham’s first foray from single seaters into sports cars. It used much of their single seater technology & design but in a widened chassis to accommodate the necessary vestigial passenger seat. Alfa Romeo is a very special and historic marque. Pre-war cars are superb and there are some particularly nice post-war cars which stand out in terms of design and quality. I’ve always liked the Bertone GTVs of the early ’70s with their compact little 2+2 Guigaro designed saloon bodies and their large wheels that make the look powerful and purposeful. The twin cam engines in these cars are lovely and lively in any capacity – 1300cc, 1600cc, 1750cc or 2000cc. In outright GTA race form they’re just awesome. There are a number of other Alfa sports, saloon, specials and race cars from the ’60s and ’70s which also stand out as design classics out including the Sprint Speciale, Giulia & Giulietta Sprint, scaled-up Bertone 2600, various Zagato specials, mad V8 Montreal, Disco Volante, the Tipo 33 and 33 Stradale. With some notable exceptions (e.g. TZ and the 4C) – more modern Alfa creations have show that it is not the power house of inventive design and cutting-edge style that it once was. The Clan Crusader was a lightweight car using Hillman Imp mechanics to create a pretty fast and nimble little motor. Between 1971 and 1974 around 315 of these fibreglass monocoque cars were produced in Washington, County Durham. Interestingly the car’s initial design was carried out by former Lotus men Paul Haussauer, John Frayling and Brian Luff and the car went into production thanks to a government grant. Unfortunately – limited finances, strikes, parts shortages and new taxes killed the fledgling company off in 1973 and various attempts to revive it since have failed. No the prettiest of cars but by all accounts – quite lively further development could have resulted in it becoming a small scale competitor to the likes of Lotus in the field of “British Plastic”! Ok – so there were only a couple of Chevy models on track but they deserve a mention. I’m not that keen on American cars in general but I do like some of their engines especially when they are in a European chassis. Ford and Chevrolet’s iconic V8s from the ’60s through to the ’80s were exploited to the full in a range of European road and race cars to magnificent effect. Chevy V8s powered a wide variety of cars including:- Bizzarrini, Bristol, Iso, Facel, Jensen, Lola, McLaren, Monteverdi etc. See my post on H is of for Hybrids (the Euro/US Variety) under the A-Z of Car Stuff page. Like then or loathe them – Ford have produced some iconic cars and some great engines on both sides of the Atlantic. This event delivered a load of Ford Lotus Cortina’s, Anglias and Mustangs as well as a shed load of 4.7 Ford engines powering the mighty TVR Griffiths (See TVR section). Over recent years the number of actively raced Lotus Cortina’s seems to have increased massively. I suppose this reflects the fact that these cars were once relatively cheap to buy and prepare but times have changed as demand and hence values have risen. ‘Stangs can always be guaranteed to provide race track entertainment especially thanks to their fire breathing V8 engines. The eponymous Ford 4.7 Litre V8 and sometimes the massive 7 Litre V8 have been used to power all sorts of European sports cars over the years including AC, De Tomaso, Sunbeam and TVR. Wales has more to be proud of than their rugby team in the form of Gilbern Cars who produced some lovely motors between 1959 and 1973 from their factory in Llantwit, Pontypridd, Glamorgan. Founded by GILes Smith and BERNard Friese – yes you’ve guessed it the name was an amalgam of parts of their respective first names. As with many small car manufacturers of the period (and some bigger ones) Gilbern went through a number of changes of ownership in the endless search for profitability before giving up the ghost in 1973. It would be unusual to go to a historic car event without seeing some Jaguars. The lovely MkI Jaguar and XK120 competing on track were immaculately turned out and there were also a couple of E-Type racers as well. I was delighted that one of the E-types was driven by fellow Cumbrian Robert Gate who’d made the long journey down from our mutual home town of Workington on the Costa del Solway-Firth. He did OK in the “night race” against some rather quick competition. Jensen Healey’s are rare birds on the historic racing scene so it was good to see this one being put through its paces on the track in the ’70s Road Sports Championship race. The Lotus name is synonymous with lightweight, fast road and race cars and of course former and current F1 cars. From an early start bolting together Lotus 6s & 7s behind the Railway Hotel pub in Hornsey North London the company moved to a new factory in Chesthunt and then an even newer facility at Hethel in Norfolk. Some of the race cars they made are featured in the Single Seater section of this post but there were some nice road cars on track and in the paddock car park too. Early Elans and Europas are reasonably common sights in historic racing but the Eclat was quite a surprise. The Elan GTS with fastback rear end was a particularly rare sight. Marcos were yet another purveyor of unusual British fibreglass sports cars. Founded in 1959 by Jem MARsh and Frank COStin they tapped into Costin’s knowledge of lightweight aircraft construction from his employment designing and building De Havilland Mosquito to use a marine ply wooden chassis in the early Marcos models. The 1800GT cars picture below not only established the archetypal Marcos body style that would last for over 30 years but they spanned the period of changeover from wooden to metal space frame chassis. The 1800 engine was from Volvo and some later Marcos cars even used 3 Litre Volvo straight-6 engines. Rust is obviously the main enemy of a metal chassis but interestingly Oil was the main enemy of a wooden chassis as it could cause the marine plywood panels comprising the chassis to warp. MG was quite well represented at the event with a number of nicely prepared MGBs and some MG based specials including a Midget based Lenham Le Mans and a Midget based Arkley SS. The Arkley body kits used to be made in Arkley, North London! Lighter and more vestigial bodywork must improve performance but I can’t get over the fact that it ends up looking like something from a Noddy & Big Ears story! Not to be confused with Peerless Motor Company of Cleveand, Ohio – Peerless Cars Ltd was founded in 1957 in Slough, Berkshire by Bernie Rodger, John Gordon and James Byrnes. The Peerless GT utilised Triumph TR3 running gear fitted into a tubular space frame chassis clothed in a fibreglass bodyshell. The car accommodated 4 people and utilised a de Dion rear suspension system. Between 1957 and 1960 around 325 Peerless cars were made and one car even managed a highly creditable 16th place overall at the 1958 running of the 24 Hours of Le Mans. Between 1960 and 1962 a modified version of the Peerless was made under the new name of Warwick by Bernie Rodger. Around 40 Warwicks were built between 1960 and 1962. The car differed from the Peerless in having a forward hinging one piece bonnet and wings (a la TVR or Triumph Herald/Vitesse) and had a stiffer space frame chassis into which a Buick 3.5L V8 engine was experimentally fitted on a couple of prototypes. Fitting V8 engines into a Warwick seemed to have inspired Peerless founder John Gordon and associate Jim Keeble to use a modified Peerless chassis as the basis of their Chevrolet V8 powered, Guigaro designed Gordon GT or Gordon Keeble as it later became known. See G is for Gordon Keeble post under A-Z of Car Stuff. Having driven to the event in my old 911 2.2E – I was pleased that there were some Porsches flying the flag on track. The 914-6 resplendent in French Porsche distributor Sonauto decals looked great. The ’65 and ’69 911s were my favourites however. You just can’t beat the perfect lines of Early 911s and they always look totally at home on the track. I’ve gone through phases where I’ve had a yearning to try a wasp waisted TR3 or meaty TR5 but there have always been other cars which have been more tempting. The TR2 and TR5 below represent two key design phases of the TR model range with the rather eccentric Walter Bellgrove designed TR2 with it’s gaping mouth later replaced in the TR3 by a more forward placed radiator grille and the Giovanni Michelotti designed TR5. I still fancy a drive in a TR5 to try out that 2.5L fuel injected straight-6. I know the TR6 has the same chassis and power train but I just don’t like the slab-sided Karmann styling. The GT6 was an evolution of the Spitfire design and whilst probably a very good car in it’s day – I was never of a fan of the Spitfire/GT6 styling bit I guess that’s partially explained by me being more of a Healey/MG man at that time and that inter-marque rivalry ran deep. It would be a bit like asking an Arsenal fan to wear a Tottenham shirt! A total of 670 Turner Sports Cars were built between 1949 and 1966 at Jack Turner’s manufacturing base in Wolverhampton. From 1954 – Jack’s design philosophy was to create a simple, affordable, entry-level sports car and he achieved this through building a sturdy tubular ladder chassis clothed in steel or fibreglass bodywork. Mechanical and suspension components varied but included Austin A series engines and transmissions as well as Coventry Climax and Ford units. A small number of early cars even featured an engine designed and built by Jack Turner himself. The lightweight construction of the cars gave Turner a good power to weight ration when compared with more mass produced contemporary sports cars and this delivered quite a number of race and class wins against more established competition. The cars featured below are Turner M1 and Mk2 models. The Mk1 of which only 40 were made normally featured 948cc Austin engines but I’m guessing that this particular one has the 1,216ccc Coventry Climax FWE engine. The Mk2 of which 150 were made was an evolution of the Mk1 to provide improved trim, standardise Triumph Herald suspension and a mix of Austin, Coventry Climax and Ford engines. I didn’t see under the bonnet of this particular car but I’m guessing from the capacity that it has a 1,500cc Ford Cortina unit. TVR – probably the best thing that ever came out of Blackpool! This was the first time I’ve seen 3000M models race in a historic event. The big turn-out of TVRs on the track might explain why I also saw an S2 Vixen parked near the paddock. It was very similar to the ’72 S3 Vixen I once owned. With their stump-pulling 4.7 Ford V8 engines – the Griffith’s were as awesome as ever but the 3000M’s looked pretty good too whizzing round the track. I really quite fancy an old TVR again for tinkering about with. Can someone please get a move on and revive this marque! The title is not mean’t to diminish the cars below – I just didn’t have enough pictures to justify a hole section to each one. They’re an eclectic bunch of road and competition cars – some vigorously raced and others simply cherished but actively driven. The Art Car Batmobile BMW 3.0L CSL is a particular favourite but I did love seeing the lovely old Bentley proudly ensconced in its dedicated BRDC parking space behind the BRDC stand.